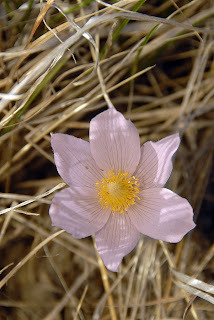 The pasque flower is the official state flower of South Dakota. 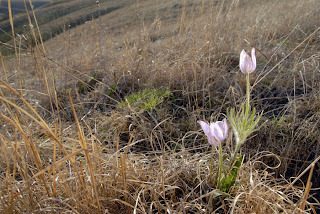 In part, it was designated that because it is one of the first flowers to bloom each spring in this part of the country. 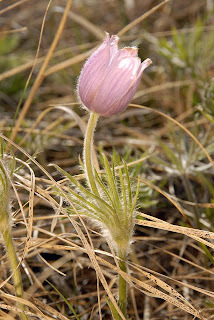 Finding pasque flowers to photograph has proven to be a challenge some years. Not only are they early to bloom, but they don't last for more than about two weeks. So if you don't catch them right away, you probably aren't going to. I'm sorry I don't have surefire advice for finding pasques, but late April is the time to start the search. 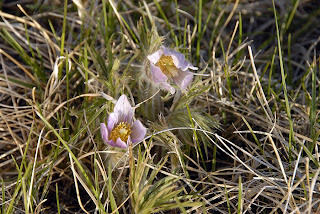 They seem to grow best on areas where the soil has never been tilled, which on the prairie tends to be rocky ridges. My best luck in the past has been in the Black Hills near Pactola Lake and on the southern end of Iron Mountain Road. I've heard that the prairies around Sica Hollow can be a good spot as well. With help from a co-worker who's originally from Ree Heights in the central part of the state and a local guide there, I found these last Monday. They are dainty little things, only about four or five inches tall. The purple coloring can be very faint, almost white at times. I always enjoy getting up in the Ree Hill's for the view. Great pictures! Just wish these flowers would last a little longer. Thanks, was my first visit to the Ree Hills, but I'm hoping it's not the last.